This morning, TIME announced that this year's Prom Queen Of News is none other than Pope Francis. 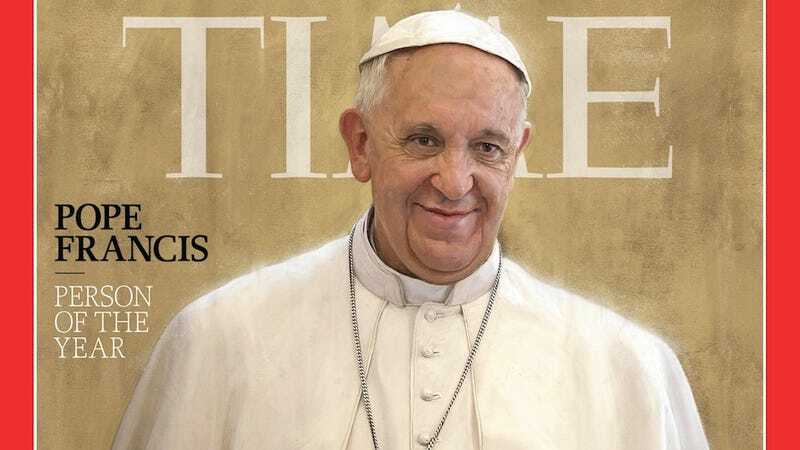 The pontiff is the perfect choice for 2013's Person of the Year — he changed the Church from a mouthpiece for intolerance into one of love and acceptance. Except not really for women. He's still pretty meh about women. But you can't win 'em all, right? He released his first exhortation, an attack on "the idolatry of money," just as Americans were contemplating the day set aside for gratitude and whether to spend it at the mall. This is a man with a sense of timing. He lives not in the papal palace surrounded by courtiers but in a spare hostel surrounded by priests. He prays all the time, even while waiting for the dentist. He has retired the papal Mercedes in favor of a scuffed-up Ford Focus. No red shoes, no gilded cross, just an iron one around his neck. When he rejects the pomp and the privilege, releases information on Vatican finances for the first time, reprimands a profligate German Archbishop, cold-calls strangers in distress, offers to baptize the baby of a divorced woman whose married lover wanted her to abort it, he is doing more than modeling mercy and ­transparency. He is ­embracing complexity and acknowledging the risk that a church obsessed with its own rights and righteousness could inflict more wounds than it heals. Francis's above mentioned anti-greed treatise and his adamant humility was far from Francis's only feather-ruffling act this year, as TIME points out. He also had the audacity to issue those refreshingly gay-tolerant statements and suggest that maybe if the Church wouldn't harp on right wing American social issues so much, maybe people would be more into actually being Catholic. Maybe. The fact that the entire world flipped out when Francis announced that he wasn't in a position to judge gay people and that maybe the Church should focus more on fighting poverty than fighting condom use really highlights the dismally low expectations people had of the Vatican. As a recovering Catholic who now identifies as agnostic (and I'm not talking, like Easter n' Christmas, complain about Lenten Fridays but still eat meat Catholic; I'm talking Every Sunday, Sing In College Liturgical Choir Catholic), Francis's presence at the helm of the Church makes me slightly less inclined to explain, red-faced, to secularly raised friends that "I was raised Catholic, but we weren't crazy or anything... and 1000% more likely to actually humor my parents by going to mass with them this Christmas. Pope Francis gives voice to most of the progressive Catholics I knew growing up and at my Catholic university, the ones who were more into promoting social justice than policing sexual practices, the anti-bigotry set. The people who used their faith as a sort of personal source of strength without being jerks about it. Those people. In addition, Francis projects an image of being incredibly loving and accepting. That footage of a little kid refusing to leave the Pope's side and instead of getting mad, Francis smiles and pats him on the head? Francis kissing the face of the disfigured man? Francis washing people's feet at a youth penal colony? Francis talking, one-on-one, to anyone? Literally anyone? I hate hugs, Francis is at the top of my Hug List. DTHug. But Francis is beating a retreat for the Catholic Church, and making sure its controversial doctrines are whispered, not yelled – no wonder the New York Times is in love. Just like President Obama loved apologizing for America, Pope Francis likes to apologize for the Catholic Church, thinking that the Church is at its best when it is passive and not offending anyone's sensibilities. So not only has he insulted, and severely damaged the work of, pro-life and pro-marriage groups with his comments, he has also gone on the attack, dismissing Catholics who attend the older rites in Latin as 'ideologizing' and being guilty of 'exploitation.' Apparently "Who am I to judge?" doesn't apply here. Awesome. This is exactly the sort of person an anti-poverty, pro-acceptance person should want to piss off. And the right wing vitriol against the Pope indicates that what he's saying isn't just pretty words; he's actually hitting a nerve. [Francis] says, "The reservation of the priesthood to males, as a sign of Christ the Spouse who gives himself in the Eucharist, is not a question open to discussion." This seems to be a new way of saying that because Jesus was male, the priest must be male. That argument has been answered so many times, it seems redundant to say it. But "imaging Jesus" is not a question of gender. To make the maleness of Jesus a controlling element in imaging him is to confuse Jesus' maleness, which is incidental, with his humanity, which is fundamental to his redemptive role. And the spousal imagery is just that: imagery. Moreover, to say that only males may image Jesus sacralizes masculinity. That being said, at this point, most people expect so little of the Catholic Church as an institution that they'll take whatever they can get; for generations, Catholics and non-Catholics have witnessed a parade of celibate men presiding over the Church by prioritizing policing sexuality over promoting justice, and Francis's reception proves the world thirsted for a change. What Francis offers isn't everything, but it's not nothing. And that's something.